Relive a harrowing daring solo voyage around the world, accomplished over nine months in a boat just 32 feet long, during a special presentation by sailor Jerome Rand on Thurs., Jan. 24 at The Maritime Aquarium at Norwalk. Rand circumnavigated the globe all alone, non-stop, in an adventure that covered nine months (October 2017 to June 2018) and 29,805 miles. His was the first amateur nonstop sail around the world that started from the U.S. (He launched from and returned to Gloucester, Mass.) Rand managed the feat in a 43-year-old Westsail 32 – nicknamed the Mighty Sparrow – that is one of the four smallest boats ever to complete the trip. There were glorious moments, like amazing sunsets, encounters with whales and dolphins, and successful passages around Earth’s great capes. But, during his 271 days at sea, equipment broke down and the harsh environment took it toll. Rand eventually had to collect rain to have water to drink, and his food supplies ran so short that he ended up losing more than 40 pounds. Rand’s Jan. 24 talk begins at 7 p.m. in Newman’s Own Hall. Doors will open at 6 p.m., so guests can enjoy all of the Aquarium galleries for an hour beforehand. 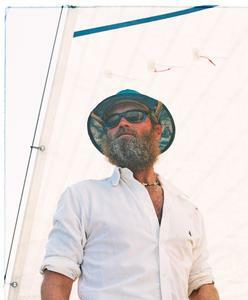 The event is presented by the Bitter End Yacht Club on the British Virgin Islands, where Rand is an “ambassador” and director of watersports. The famed destination, which is working to reopen after devestation from hurricanes Irma and Maria in 2017, has introduced Bitter End Provisions, a gear/clothing line. Tickets are $15 and available online at www.maritimeaquarium.org.